Newly, Stoneage has launched their winter collection 2013-14 for Women and Men. Stoneage is one of the most leading and well-known fashion brands in our country. Stoneage is a fashion brand who has emerged on the screen of fashion in year 2004 and since then they have launched so many seasonal collections. After the great launch of that collection, now Stoneage winter arrivals 2013-14 for women & Men has launched. This collection has consists of western wear outfits for young Women & Men.Stoneage has launched their winter collection 2013-14 for women & Men. 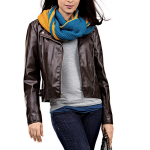 This collection of winter arrivals 2013-14, you will find jeans, tops, blazer, jackets, mufflers, foot wears and clutches. Stoneage is a fashion label who offers casual wear and party wear apparel, foot wears, hand bags, clutches and fashion accessories. They mesmerize men and women with western wear outfits for their wardrobe. This collection has consists of apparel for young girls, as it is a youngsters clothing brand in Pakistan. The colors sued in this collection are yellow, red, blue, black, brown and etc. They all are perfect for casual wear and party wear both.